Well, this is going to be the most comprehensive Guide on Seedbox. Please stay with me here and by the end of it, I assure you that you would have enough information to understand every aspect of Seedbox. Part 1. What is a Seedbox? 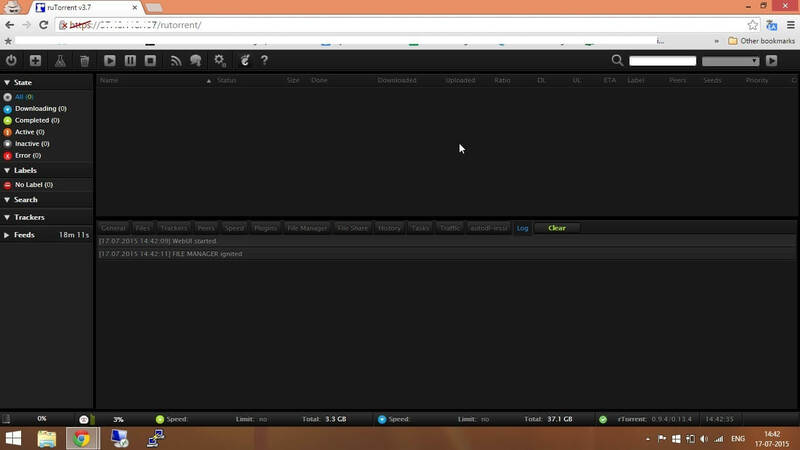 As you can see it pretty much looks like most of the torrent client in your PC, but it runs as a web application. if you want to learn more about how to use the ruTorrent web application you can find the ruTorrent guide here: Rutorrent seedbox guide. If you want to learn more about how to add torrents in the seed box you can find the Add torrents to seedbox guide here Once you add a torrent on Seedbox the torrent downloads on the server and automatically starts seeding. If you have read the above part, you understand that Seedbox is just a remote computer for torrenting. Now the question comes, how do you transfer the files. Well, its very similar to how you transfer your files to your external HDD or vice versa, but in this case the connection is not with a USB cable but your internet connection and the protocol (or the method) you need to use is called FTP (file transfer protocol) or sFTP (secure file transfer protocol). As complex as it may sound it is basically nothing but methods of transferring your files from the seedbox PC to your PC, you would need a software like Filezilla. You can read more about connecting to your seedbox with ftp here. It’s as simple as dragging and droping files/folder from seedbox to your PC. Well, that’s pretty much it, I didn’t want to drag it too long. Let me know, what aspect you don’t understand and I will add it here. I get a lot of questions on people asking me what is an anonymous seedbox. In this article, I would like to point out a few things that will help you understand better. Running seedbox itself is anonymous because the tormenting doesn’t take place in your pc but rather on a server. It is definitely not recommended to have your seedbox details linked to your payment account on the company provider’s server, in case the website is hacked all details are out in open. Ensure your rutorrents link has a basic https encryption. VPN is definitely a bonus if your country has already started blocking torrent websites. Always use sftp to transfer files, though FTP is also not monitored by the ISP’s, encryption is definitely better. Do not share your seedbox link in public or share with other individuals. Ensure you have a strong password, in case you are not able to log in your account inform your provider immediately. While registering do not put your exact details, neither use your original email password while registering for a seedbox. It ius alos possible to ruin your seedbox from your own vps. Why Should I Use A Linux VPS Server?There are plenty of reasons to host your websites on a Linux VPS. The most significant advantages of choosing a Linux VPS hosting service are the full root access to the virtual server and the freedom to install and run any application or service you wish which you could run on any other Linux dedicated server. Why Is A Linux VPS Better?Linux VPS Hosting provides more enhanced security and guarantees complete isolation from other virtual servers residing on the same physical server. It guarantees a set amount of hardware resources (such as memory, disk space etc.) that no other customer can utilize. How Can I Benefit From A Linux VPS?A Linux virtual server is inexpensive in terms of price (unlike a dedicated server). It is allowing you to host unlimited domains, databases, mailboxes, etc. Our Linux virtual servers can be configured anyway you want them, with a choice of multiple Linux distros including CentOS VPS,Fedora VPS, Ubuntu VPS, Debian VPS, Arch Linux VPS, Scientific Linux VPS,openSUSE VPS all with or without the DirectAdmin control panel. We offer multiple Linux VPS plans tailored to suit even your most demanding needs. All Linux VPS hosting accounts are hosted on high performance, reliable, Dual or Quad Xeon servers running the Linux operating system and are maintained by our team of highly experienced Linux admins. All our Linux virtual server hosting plans are equivalent to a real server, they look and feel as if you are running your own Linux-based dedicated server. All our virtual server hosting plans are semi-managedunless indicated otherwise. We believe to be offering the most affordable virtual dedicated server plans on the Internet. If you find another public, comparable Linux VPS offer at a better price, please email us the details and we will do everything we can to match it or beat it. A Linux VPS has the same flexibility and benefits of a dedicated server at a fraction of the price. Compare VPS vs DedicatedOur Linux VPS Hosting is rated 4.9 out of 5 by 74 customer reviews. NextCheap Seedbox for you can go a long way. Know why seed boxes might make such an impact.